A shrine, to me, is a representation of a sacred intention of honor, love and respect. A month or so ago I posted a shrine that I was inspired to create after reading Sue Monk Kidd's book "Traveling with Pomegranates". I found her writings about her search for her sacred feminine self intriguing and provoking. I love the way she writes, I love how everything she sees holds meaning for her, an opportunity to know her self better. I am still thinking about her book a month later, and I felt motivated to create a shrine that I could carry with me. 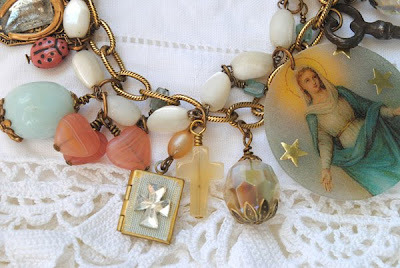 I used a length of a vintage rosary I found during my trip to Paris this past spring, and re purposed a piece of chain to mingle with it. I then began creating charms from beads, stones, brass...anything that had a symbolic meaning for me. 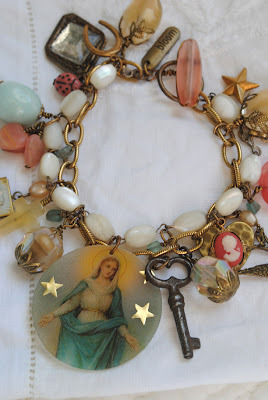 This bracelet honors the mother in me as well as the sacred mother...it is really about unconditional love and birth. It is an affirmation for this next chapter of my life, now that I am past the cycle of physical fertility. The blue egg shaped stone represents the birthing I will be doing from my creative heart. 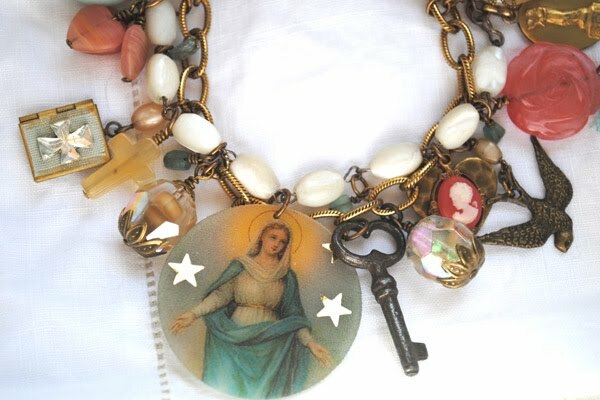 The Mother Mary circle was actually from a pair of earrings. I have used one of them in my bracelet to symbolize being held in the arms of unconditional nurturing love. Each charm in some way holds the intention for creativity, inspiration, courage, luck, beauty, writing, redemption, forgiveness and imagination...Whew! This bracelet hold a lot! I have been catching up with as many of you as I can each day. I love visiting your blogs and hearing about your thoughts and seeing your creations. Beautifully done Terri and beautifully writen! Love all of the meaning that each piece has. i just hit 50 as well and now it is our time!!!! What a splendid way to celebrate YOU! A great idea!!!! You are one special woman! Terri..a magnificent , powerful piece of beauty, sacred energy and spirituality..pure light! !It is wondrous and gorgeous!It is so wonderful to make personal/ special creations..awesome! Shine on!!BEAUITFUL! Such a beautiful creation you have made....just lovely. 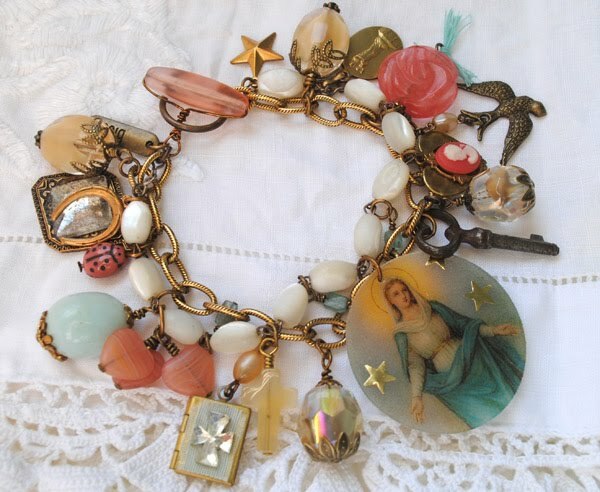 Your shrine collage bracelet is beautiful. I love how you described it and the though that went into each piece. Your bracelet simply takes my breath away. You are so very creative. Lovely lovely. So glad to have you back home as well and hope to hear more about your travel adventures. Wow! This is so gorgeous! Love it! Terri, it's beautiful. You do the "twists" at the end so neatly! Oh, my gracious! I LOVE this. Thank you for sharing. It is absolutely inspiringly beautiful. That's a beautiful treasure, with so much thought and meaning behind it. Lovely. This bracelet is simply stunning, Terri, I really love all the elements you've added and to read about how much they mean to you is even more special! Thank you so much for your kind comments everyone! Hugs to each of you! 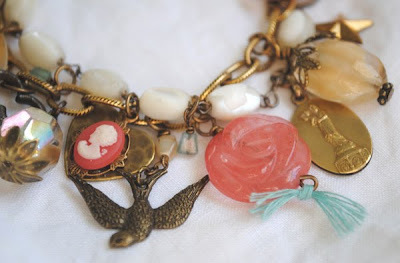 Terri, Your bracelet is breathtaking and a wonderful post. I too cherish my sacred pieces, their getting harder and harder to find! Thank you for entering my giveaway and best of luck. Terri, your bracelet is beautiful, and I love the sentiment it carries for you. What a wonderful and creative idea! Your beautiful thought process is exquisitely carried out in this stunning and precious shrine bracelet. Thank you for sharing this very unique and special piece of your heart. Dearest Terri, This is such a beautiful piece and with such special meaning~ I haven't read the book you mentioned but hope to it sounds intriguing. Lovely!!! This is very precious Terri....and beautifully made. I really enjoyed The Secret Life of Bees; now I need to track down this new one. Glad you told us about it! Fabby Shrine and wonderful meening too!